George Wheeler just found out he has cancer. There… it’s out there now. To Wheeler, who was a tenacious defensive tackle at East Carolina from 1966-70, it’s just the way it is and it’s something he will take on the only way he knows how — directly. And that’s all Wheeler had to say about that. To know George Wheeler, it seems, is to know true determination and an immense love of the game of football. Though he stood just 6-1, at 230 pounds Wheeler was recruited as a down lineman. What he lacked in size, he made up for in toughness — a byproduct of his prep environment. “Football was my life… really,” Wheeler said. “In my small town, football was everything… everything. You played high school football and then a select few went on to college. The others went right to work. (High school football) was the zenith of our lives. Getting a scholarship was a huge deal for Wheeler and his family. VanSant took film back with him and after some review, East Carolina offered. Quietly, Wheeler rejoiced inside that his dream would come true. And when he visited the East Carolina campus, the excitement was driven home. “Campus… it was the biggest place I had ever been in my life,” Wheeler said. “To tell you the school (at ECU) was bigger than my home town, would not be too much of an exaggeration. It was just such a big-time place. I just loved it. I got to meet the coaches and some of the players. I had more fun than a barrel of monkeys that weekend of the spring game." Overwhelmed with his new surroundings, Wheeler was equally impressed with his new coach. But it was the impact that VanSant first had on Wheeler that established the beginnings of what would be a stellar career. And, it started from Day One. “(The freshmen) were all sitting in the room, about 120 or us,” he recalled. “All of a sudden, we heard these wingtip shoes coming down the hall on those hard tile floors. ‘Pop! Pop! Pop!’ It was like the opening scene of ‘Patton’ — and in walks Coach VanSant. With the fear of VanSant instilled in the young Wheeler, it became abundantly clear very quickly that the diatribe was not mere lip service. “We had these two GAs (graduate assistant coaches),” Wheeler said. “Corey McCray… he was supposed to be a real player and he had some serious guns on him and I looked at him and was thinking, ‘Who is this guy?.’ And they had another guy, the darndest fella I ever seen in my life, with these big Coke bottle glasses, John McFall. He was the meanest, nastiest, quickest outside linebacker I’ve ever seen in my life. (One practice) he grabbed me by the facemask and was chinning himself on the facemask. Lord have mercy, what a man. These were my coaches and this was every day life as a freshman. That freshman team goes down in ECU history as one of the most talented teams fielded at East Carolina and formed the foundation of the school’s ascension in Division I football. 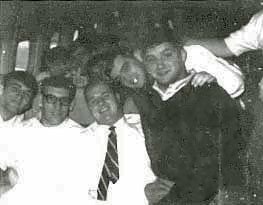 It was just that the freshmen all “meshed” perfectly together, as demonstrated by their last game in 1966. The success carried forward for Wheeler and he came to know, firsthand, the fire in Stasavich. But it was what he said to Wheeler on the bus ride home that got the sophomore pushing himself even harder. “He looked at me and said, ‘Boy, did you make a play out there today?’ I said, ‘I think so.’ And he said, ‘Well, that’s a start.’ (Stas) was something else. He was a great man. I had great coaches and great people around me. fellow Pirates on the road. Though it is obvious how much Stasavich and VanSant influenced the young Wheeler, it was another teacher that, perhaps, set him on his true course. Martinez’s words had a profound impact on Wheeler’s psyche. Where Martinez helped Wheeler identify his ability to be more as a student, it was Coach Stasavich who forced him to become a man. Stasavich shook Wheeler up with that one and went on to tell his player that he had half the summer to work and earn enough money to pay for second session and then earn the grades. “I worked on this steel roof crew and ended up with blisters from elbows to hands,” he said. “I worked hard for six weeks and saved every penny I made so I could go to summer school. I remember getting to the Registrar and had just enough money to pay for tuition. I had just 35 dollars left over. I mean, tears rolled down my cheeks. I remember thinking, ‘That man (Stas) is right, I am a dummy. Now I am buying what I was getting for free.’ But, I made six hours of A’s and I was eligible. From then on, I was on either the Honor Roll or Dean’s List the rest of the way. Wheeler graduated in 1971 from Graduate School and couldn’t resist the lure of coaching. And, ending two years ago after retiring, Wheeler has had some amazing experiences as a 29-year coach. 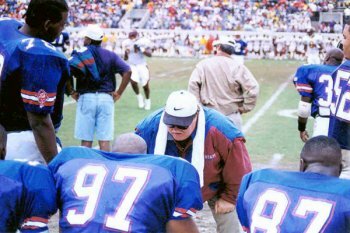 Wheeler retired in 2000 after a decade at South Carolina State University, where he coached the likes of Robert Porcher and Chartric Darby. But his path to his final coaching assignment contained a number of great experiences, starting with a stint at North Carolina A&T University. After success at A&T, Wheeler headed for an interview at the University of Arkansas with then-head coach Lou Holts, where fate would intervene in many ways. Florence, who is now the rock of support for Wheeler in his battle to beat cancer, has her own place in history. Florence was a flight attendant on one of the most famous flights in American history. Though it was just another day of work for her, to history, it was the day that D.B. Cooper leapt from the commercial airliner with a bag of dough, never to be heard from again. To talk to Wheeler, it becomes quickly apparent that he and Florence have a special marriage. Even in recounting his career, she is clearly an avid fan — of her coach, if not the sport he loves so much. Holts and Arkansas were just too good to turn down, so Wheeler made the play. Wheeler then moved, in 1978, to the Midwest to join Warren Powers’ University of Missouri staff where he coached until 1982, before giving the professional ranks a try. 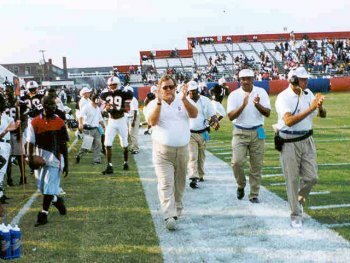 In 1983, Wheeler went to the USFL to coach the defensive line for friend Chuck Fairbanks with the New Jersey Generals, where he got the pleasure to help mentor former Georgia great Herschel Walker. Along with coaching great players, the New Jersey Generals also gave Wheeler his first taste of the worst of football when Manhattan mogul Donald Trump bought the team. 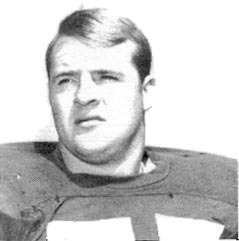 That was enough to make Wheeler yearn to be back in the college ranks, so he returned to Missouri and coached on Woody Widenhofer’s staff. Eventually, he landed in South Carolina, where he joined the staff at South Carolina State and decided to make his permanent home. He retired two years ago and is now a sales executive for TNT Fireworks, Inc. But, he will always be a coach by title and trade. It was, after all, coaches who most affected his life. Wheeler credits his players and his former coaches and teammates for ALL of his personal successes. “My life has been like a piece of driftwood going down a stream,” he said. “Everytime I get washed ashore, somebody picked me up and put me back in the stream. There have always been good people always there to show me the right way. I don’t know, maybe I’ve attracted those kinds of people in my life. People have cared about me. I owe my life to other people, from my mom’s kindness and my father’s toughness to my teammates — a group of guys who would give me the shirts off their backs. They have always come through for me. Today, despite his diagnosis, Wheeler still feels he has been blessed. And, like a true Pirate, he believes. Sales Manager, TNT Fireworks Inc.